The Northern Ireland assembly election will be held on 7 March as planned, Tony Blair has confirmed. The prime minister was speaking after meeting Irish Prime Minister Bertie Ahern at Downing Street. He said the election could be "the start of a completely different future for the people of Northern Ireland". The Stormont Assembly was suspended in October 2002 over allegations of a republican spy ring, and direct rule from London was restored. The court case that followed collapsed and one of those charged, Denis Donaldson, later admitted working as a British agent. Mr Blair said it had been several years since the executive at Stormont was dissolved. "During that process of time the people of Northern Ireland have been without the direct voice that they wanted," Mr Blair said. "Now we have the prospect over these coming weeks of managing to ensure that the executive goes back up and we have a proper set of devolved institutions on a basis that is sustainable." There was "a tremendous yearning now for this process to reach its proper completion", he added. Mr Blair and Mr Ahern said Sinn Fein's decision to endorse policing and Tuesday's report from the Independence Monitoring Commission provided further reassurance that Northern Ireland had moved on. "Our purpose now is to ensure that Northern Ireland can build on all of these positive developments through the restoration of shared, accountable government committed to serving all of the people," the prime ministers said in a statement. They said devolution would be restored if there was proper support for the rule of law and the police from republicans, and a commitment to power sharing by the 26 March by the DUP. 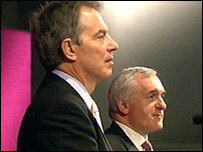 Mr Ahern said Mr Blair was "convinced", from his talks with DUP leader Ian Paisley, that it was ready to take part in a power-sharing executive, adding: "I accept that." However, he also said that if a power-sharing executive could not be formed, then the assembly would not meet and the two governments would return to the partnership arrangements set out in the St Andrews Agreement.